The line between art and illustration is thin, if it exists at all. In the 19th century, however, fine art (painting especially) distinguished itself from the crass commercialism of mere illustration. Paintings like “The Apothecary,” for example, were intended to accompany magazine articles, to act as “stills” from a novel, or to appear on dust jackets; they advertised products, plays and films. They never appeared in museums or galleries. Not until Howard Pyle and N. C. Wyeth established the Brandywine School, that is. Karl Wasserman’s gouache painting advertised “The Apothecary,” a play co-written by Agincourt activist Abel Kane and Miloš Švec, World War II refugee from occupied Czechoslovakia. In 1943, Švec evaded Soviet forces and made his way through Italy to Casablanca; then secured passage to the United States and an adjunct teaching position at Northwest Iowa Normal. During the fall semester of 1944, Abel Kane assisted with the adaptation of Lékárník, Švec’s symbolist novel of political corruption. Ticket sales for “The Apothecary” and free-will donations supported shipments of food, blankets and winter clothing to Europe. 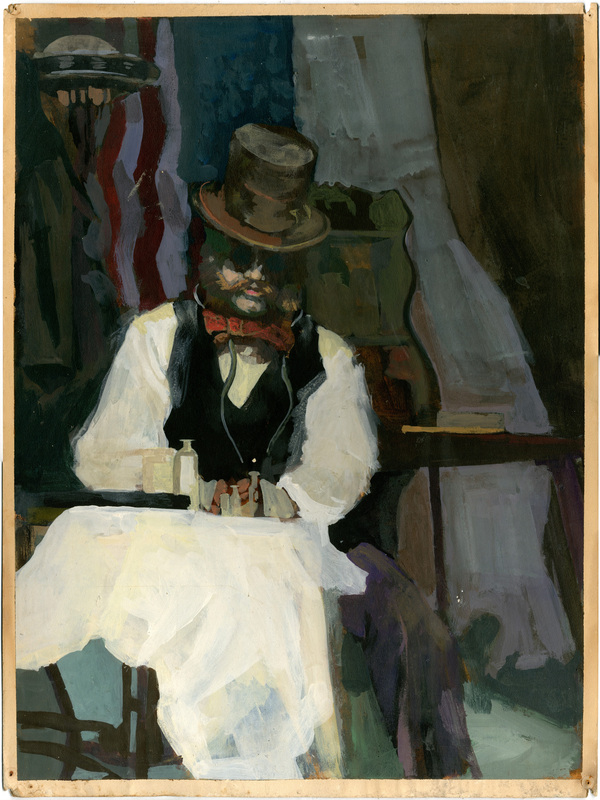 The Normal College archive transferred this painting to the Community Collection in 1973, memorializing long-time faculty member Karl Wasserman. By agincourtiowa in Landscapes & Livestock, Uncategorized on Friday/13/April/2018 .